C.S. Lewis once wrote that “friendship is born at that moment when one person says to another: ‘What! You too? I thought I was the only one’”…and throughout my time here, there were a lot of these moments, and friendships that were born. Throughout this past (almost) year, I have learned many things. I’ve learned how to set goals and accomplish them, like –asking more questions, but then learning to not ask too many questions, and breaking large tasks into small ones and staying organized. I’ve learned that it is important to make to-do lists and follow them, so that I don’t forget tasks, and I’ve learned how to use Photoshop (which was a ton of fun). But the most valuable, and unexpected, thing I have learned is how, not just one, but many friendships can be born in the most unexpected places. My unexpected place was the Leadership and Student Engagement Office, where I met some of the most supportive, dedicated, and hilarious individuals who all have one common goal: to create positive experiences, and a community for students. To give you some context, the Leadership and Student Engagement Office is split into four different portfolios. There is Orientation & Transition, Leadership, Student Life, and Community Engagement. I was a part of the Community Engagement team but had the privilege of working with or getting to know everyone in the office. The office is also an open space where most of the professional staff have offices with doors, whereas the student staff work in a more open space, and there is a front and a back of the office. During the summer some of us from the back of the office started having “9 a.m. check-ins” with each other. The “9 a.m. check-ins” consisted of updating each other with news from each of our lives. In these meetings we laughed, a lot, but also supported each other through some tough times. Through listening to the stories of others I also had many “What! You too?” moments. Nisha who sits across from me, but who I can’t see, always came to work with funny stories and anecdotes of current or previous experiences with life. Amy, and Shannon sat in the back with us as well for the summer and were regularly a part of the “9 a.m. check-ins”. Helen, who was then part of the Orientation team would also occasionally join. Brielle was the other Community Engagement Assistant and someone I sat beside every day of this experience, without who I would not know as much about Belize, ice skating, Miss Universe candidates, and Mangonadas. Andrew was my supervisor. He provided me with guidance throughout my experience, answered all of my questions, assigned me fun work tasks (like planning Trick-or-Eat), and always had a “Real Housewives” quote ready to add to any conversation to keep things fun. I was inspired by his dedication to think of new and innovative ways to draw students’ attention to our programs, like wearing life jackets to promote our ucalgarycares Costa Rica program, or wearing a unicorn onesie to catch people’s attention while collecting donations for the SU Campus Food Bank. He has a way of keeping things positive and fun that, in my opinion, draws more students to want to be a part of our programs. This friendly and fun personality has even gotten him free coffees from Starbucks, and sandwiches from Subway (which regularly happened). As the summer came to an end, I was excited to find that new student staff would be filling the empty desks in the back of the office. Enter the Leadership Ambassador team Winnica, Tyler, Dan, and well Nisha (who just couldn’t leave us so she transitioned into another role). 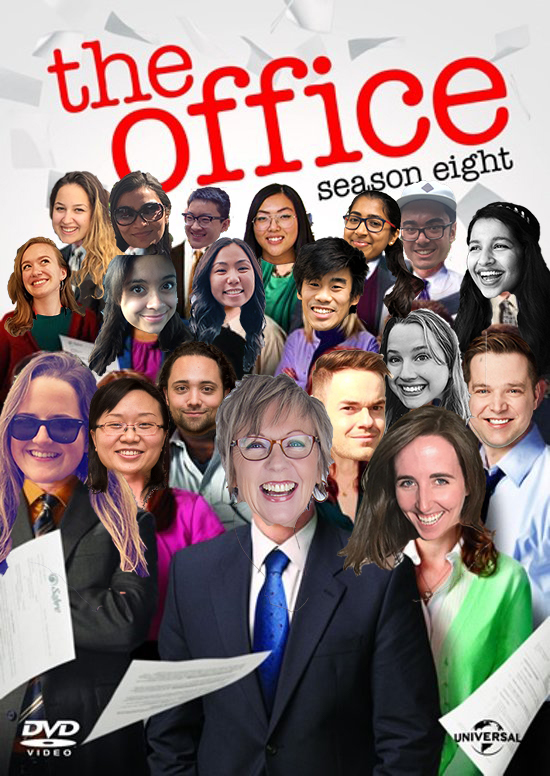 This team of fun individuals added even more positivity to the office atmosphere (which I did not know was possible). We were also introduced to the new student life assistant Srishti as well as Helen, who was previously the Orientation Academic Assistant. More laughs, more talks, and more “9 a.m. check-ins”. Two more people who are part of the LSE professional staff and inspirations that made a big impact on my experience were Heather and Vicky. They were regular attendees of “9 a.m. check-ins” but were also always willing to, and enthusiastic about, answering questions I had that related to programs and events that they organized and ran. Another inspiration and drop-in attendee of the check-ins was Renata who, despite always being busy and going from meeting to meeting, usually eating on the fly, and always looking 100%, managed to fit-in some story sharing into her day. An amazing group of people. To further illustrate what some of these moments looked like, here is a real-life example: I was cleaning up my desk area one day when I found a long bamboo stick located between my desk and Brielle’s desk. As it was an odd thing for me to have found, I pulled it out and laughed with others while trying to figure out how this stick got here and where it came from. As I mentioned before, Nisha sat across from me but I could not see her, so I took this stick and put it across both of our desks (where it has been sitting ever since). Not knowing how she would respond, I told Nisha that if we each grab one end of the stick we can be holding hands because we already couldn’t see each other… she laughed. This became an inside joke and a “What! You too?” moment when I realized we had the same sense of humor. We later found out this stick was used to hold up a plant in the office but we kept it at our desks anyway. I was very grateful to be able to have moments like these, especially between my busy times of planning and preparing for an event or program or writing up a report, or doing research for a potential new program. While writing this blog I came to the realization that I might not know when to stop writing. How much is too much? But it is hard to decide to introduce some people and share some stories and not others, when everyone and every story has had a considerable influence on my time here. These individuals who I was introduced to as my co-workers, but will leave as my very close friends, have taught me what it means to have support in a workplace. Throughout the events and programs that took place, from Trick-or-Eat, to recruiting students for ucalgarycares programs, to collecting donations for the SU Spring Food Drive, I knew I could always count on them to be there to provide support for myself and the Community Engagement team. With 16 more days to go I’ve come to realize that probably the only downside of this whole experience, is that after April 12th, I will no longer be working here with these individuals and be able to regularly see them. It just goes to show how much of an impact the people you work with can have on your overall experience, and I was lucky enough to be a part of this team. Pictured above, from left to right: Winnica, Heather, Vicky, Andrew, me, Nisha, Helen. These were some of the people I could gather for a last minute group photo, and no Nisha and I did not coordinate our outfits. I would like to thank everyone that I have not mentioned, for the friendship, advice, collaboration, and stories they offered and shared. So thank you to Travis, Gareth, Carllie, Shirin, Xing, and Clare and everyone else I have mentioned. As Andrew would say, and Tina would sing “you’re simply the best”… office. This entry was posted in Student Posts. Bookmark the permalink. Milana, you’re the best! the leadership and engagement office is one of the most lovely places in the campus because of the amazing people working there!